Cucina Fresca Gourmet Foods began making handcrafted pastas in Seattle’s historic Pike Place Market more than 30 years ago. Since its humble beginnings, this small mom-and-pop shop has moved twice to meet community demand. Over the years, the foodservice side of the business became its mainstay working with restaurants, service delis and corporate cafeterias in Washington State. In 2002, retailers such as Whole Foods Market began inquiring with Cucina Fresca about creating a retail line of products similar to what it was buying for its service delis. One year later, heeding several retail requests, Owner and Executive Chef Brad Glaberson set out to develop a complete line of fresh pastas, fresh sauces and gourmet frozen entrees. Inspired by fresh, high quality ingredients like vine-ripened tomatoes, first cold press extra virgin olive oil, premium cheeses and fresh picked basil, a gourmet line of prepared foods was born to a cult-like following of foodies, families and friends. Today, Cucina Fresca Gourmet Foods is a leading producer of natural prepared foods for retail and foodservice. Cucina Fresca products are available in more than 1,500 grocery stores, specialty shops and foodservice channels throughout North America. The company’s foodservice line has also grown to offer more than 130 items, many of which are seasonally inspired. Chef-owned and operated, Cucina Fresca remains true to its roots, guided by a philosophy of “product over profit.” Chef Glaberson leads a “taste-driven” company, creating superior quality offerings made in small batches from the freshest, highest quality ingredients. The company is dedicated to sourcing local ingredients and adopting sustainable practices whenever possible. Everything Cucina Fresca creates is handcrafted in the company’s own 12,000 square foot culinary facility in Seattle to ensure delicious perfection every step of the way. Brad Glaberson has been creating outstanding food for more than 20 years. 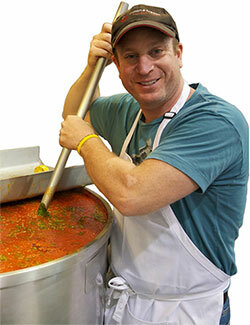 His passion for pasta began at the esteemed Culinary Institute of America where fellow students struggling with making pasta from scratch were told to “go see Brad.” Since then, he has had a knack for making great fresh pastas and other delicious comfort foods. Brad joined Cucina Fresca in 2002 as general manager – he quickly fell in love with this small company “with great potential” and after a few short years, purchased the business. Today, Brad is the Owner and Executive Chef. As a chef-run business, Brad’s main priority at Cucina Fresca is product development – creating great tasting new products on a seasonal basis. However, he is involved in every aspect of the company from sourcing to manufacturing to packaging design and more, to ensure only the highest quality ingredients and best practices are utilized to create superior offerings. Prior to Cucina Fresca, Brad worked as a demo chef at the upscale Canyon Ranch Spa in Arizona, where he taught hands-on cooking classes for resort guests. From there, he moved to Seattle to work as an Operations Manager at Cougar Mountain Baking Company and then Pasta & Co., where he was in charge of recipe development and all culinary operations. Brad’s passion has always been food. He looks forward to getting into the kitchen every morning, and finds great joy in creating delicious recipes to share with his loved ones and customers! Outside of work, Brad is an avid cyclist and triathlete, and has completed five Ironman Triathlons to date. When not training, Brad enjoys spending time with his daughter – most likely cooking up something delicious – or serving the Seattle community. Our first passion is offering awesome, fresh food for people. Our second passion is helping fellow earth-dwellers. Each month we contribute to the following organizations. Oh, yeah, one more passion to share. Cucina Fresca is a proud sponsor of the Seattle Super Squadra (S3) cycling team.